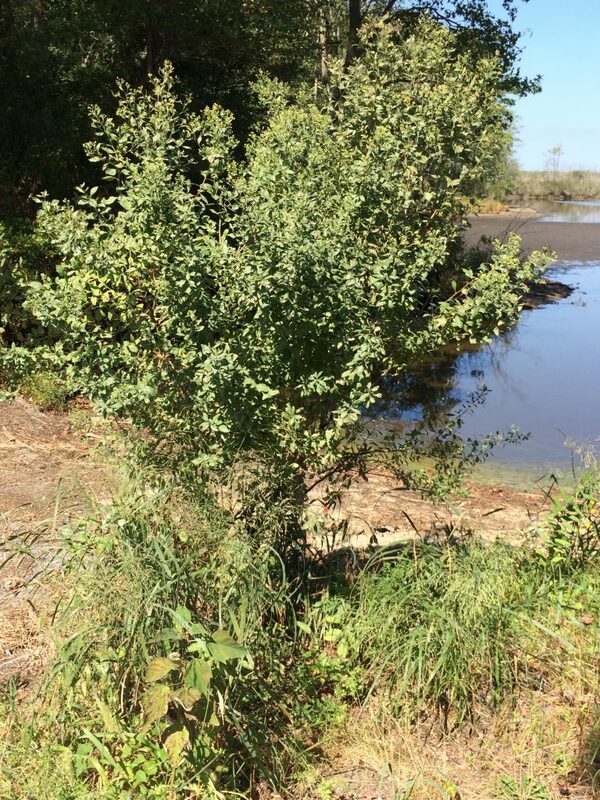 Baccharis halimifolia is a shrub 1-3 m tall, bark fibrous gray-brown, new growth green, slightly sticky. Leaves at Loxahatchee National Wildlife Refuge, Florida – Credit: Forest & Kim Starr – Plants of Hawaii – Image licensed under a Creative Commons Attribution 3.0 License, permitting sharing and adaptation with attribution. 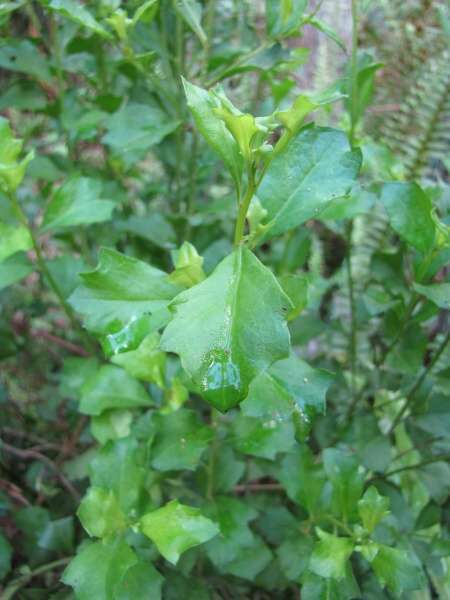 Leaves alternate, stalk short, blade to 6 cm long, 4 cm wide, wedge shaped, upper half coarsely toothed; upper leaves narrow, entire, surface covered with sticky resin, a deterrent to attack by many insects; leaves expand mid May; winter plant leafless 121 days (Britton 1874). Flowers very small, inconspicuous, tubular, thread-like, radially symmetrical (discoid), no rays; sexes on separate plants (dioecious); female flowers white-plumed, male flowers flat, yellow due to copious pollen; flowers clustered in dense heads, arising from the expanded top of the floral stalk, and surrounded at their base by small bracts in several overlapping rows, 0.4-0.6 cm tall; heads in branched clusters amid small leaves (bracts); wind pollinated; blooms and fruits Aug.-Oct.
Fruit dry, 1-seeded, achenes, with white plume, wind dispersed into winter. 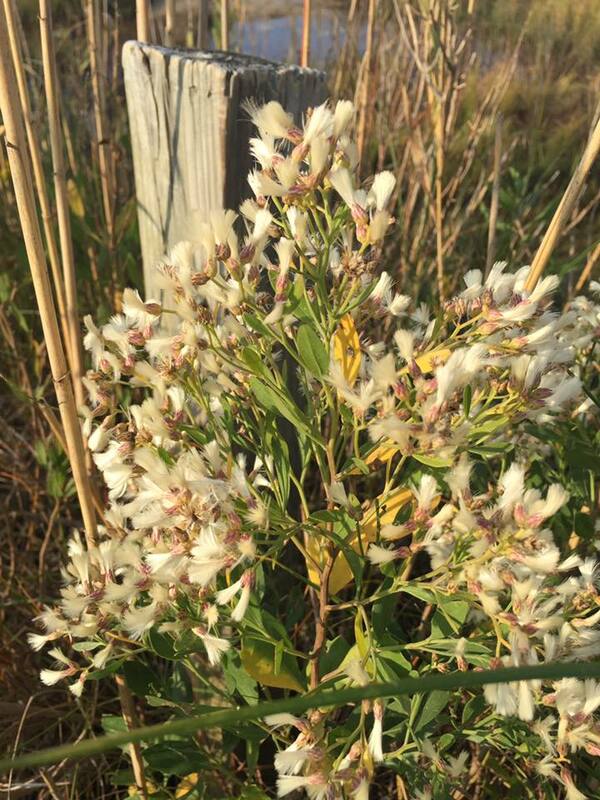 Male plants senesce earlier in Autumn than females. Habitat: High salt marsh, beach margins, moist fill near shore soil pH 5.5-7.8 (USDA, NRCS 2010). Not shade tolerant. Notes: Very much like Iva frutescens, but generally found on higher ground. Leaves eaten by two species of Chrysomelid beetles, Trirhabda bacharidis, a specialist and Paria thoracica, more of a generalist feeder, the larvae are root feeders. Flowers are attacked by larvae of several flies (Krischik and Denno 1990).